Surprised! 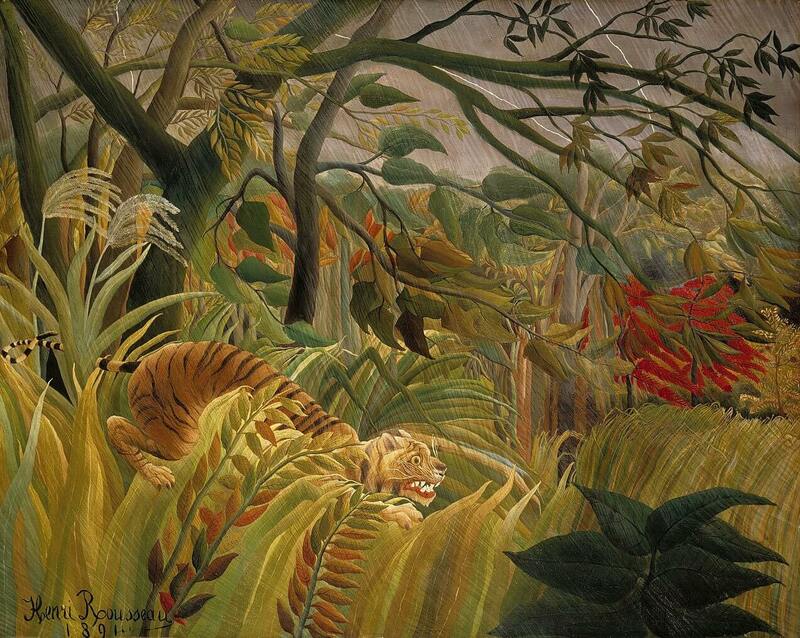 (or Tiger in a Tropical Storm) is painted by Henri Rousseau in 1891. It was the first of the jungle paintings for which the artist is chiefly known. It shows a tiger, illuminated by a flash of lightning, preparing to pounce on its prey in the midst of a raging gale. Unable to have a painting accepted by the jury of the Academie de peinture et de sculpture, Rousseau exhibited Tiger in a Tropical Storm in 1891 under the title Surpris!, at the Salon des Indépendants which was unjuried and open to all artists. The painting received mixed reviews. Rousseau had been a late developer: his first known work, Landscape with a Windmill, was not produced until he was 35, and his work is marked by a naïveté of composition that belies its technical complexity. Most critics mocked Rousseau's work as childish. The tiger's prey is beyond the edge of the canvas, so is it left to the imagination of the viewer to decide what the outcome will be, although Rousseau's original title Surprised! suggests the tiger has the upper hand. Rousseau later stated that the tiger was about to pounce on a group of explorers. Despite their apparent simplicity, Rousseau's jungle paintings were built up meticulously in layers, using a large number of green shades to capture the lush exuberance of the jungle. He also devised his own method for depicting the lashing rain by trailing strands of silver paint diagonally across the canvas, a technique inspired by the satin-like finishes of the paintings of William-Adolphe Bouguereau. Henri Rousseau's work continued to be derided by the critics up to and after his death in 1910, but he won a following among his contemporaries: Pablo Picasso, Henri Matisse, and Paul Klee were all admirers of his work. Around 1908, the art dealer Ambroise Vollard purchased Surprised! and two other works from Rousseau, who had offered them at a rate considerably higher than the 190 francs he finally received. The painting was later purchased by the National Gallery, London in 1972 with a contribution from the billionaire philanthropist Walter H. Annenberg.